RE: Anyone tried that Burst Spy software that was just released yet? Ask we speak Im coding a webservice that does the same, but you do not need to run any software and the notification is via e-mail instead. 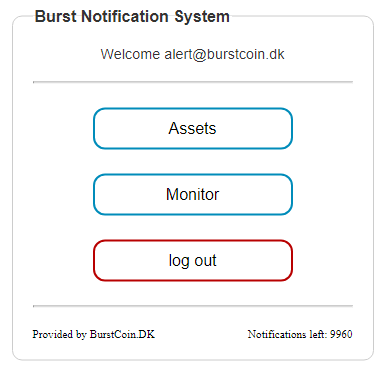 I have just released a brand new FREE system called "Burst Notification System"
All notifications will be send via e-mail. Each user have 200 email notification (might be more later on) ones all are used you can just send you email again and you will get a new login with 200 notifications. You can update and manage all you filters online via a web interface on you pc, tablet or phone. So, how do you signup? Well its easy ! To use this interface you must send an encrypted message with burst with your e-mail to BURST-9EHG-PMEG-G45Y-4ABLX and the you will recive an e-mail with login details. Make sure ONLY to enter your e-mail in the message and also to encrypt it. Ive just developed a system that can send you email when you receive burstcoins payment in your wallet. Each e-mail costs 0.1 burstcoin and the system is super easy to use. 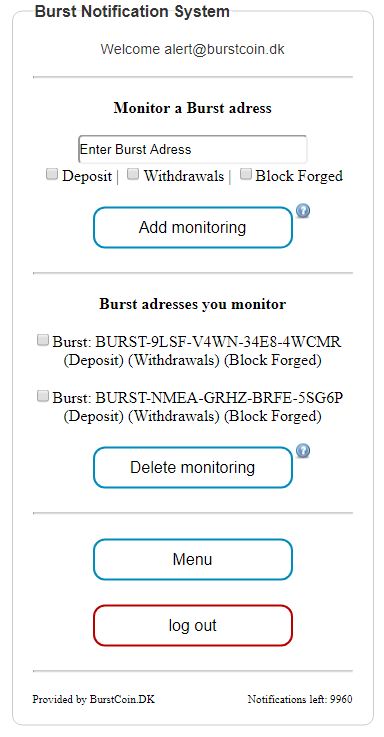 All you have to do is to send the amount of Burstcoins you want to use to for BURST-NMEA-GRHZ-BRFE-5SG6P for receiving emails. In the transfer, you select “add message”, “encrypted message” and enter your e-mail. It’s very important that you only specify your e-mail in the message box and add message and encrypted messaging is selected. The system will then monitor your account once ever 5 minut. It would look like below, though with your own email specified. @RichBC Your right, but there is one thing Adam needs to learn! If you want to be best in class, you need to show respect to the community and not be a Nazi type. His not in it for the community - he does all of it for money! One day people will see how fake he is even with his propaganda. And yes Im sorry but I don't have respect for people who steal credits for others work, Dictate on people, public harras people with picture on websites ect. Burst Notification System is now online for everyone and its free! I do not recommend to use online wallets. They are not safe. Balance in Euro now added as info in the notification e-mail. For the next 24 hours the Payment notifications system will be free to use. (10 notifications). 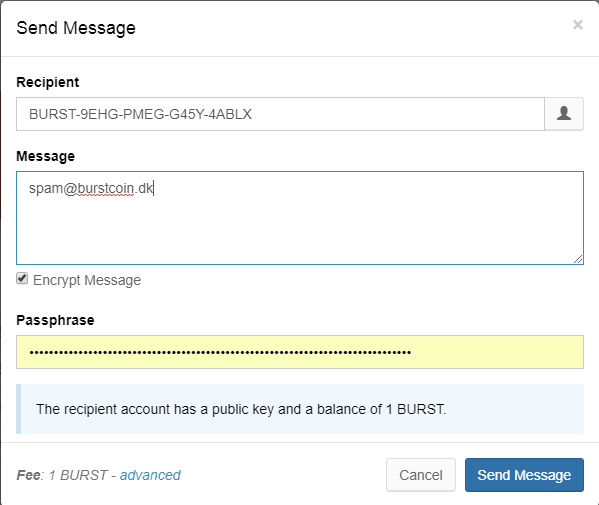 Just send a burst message as described above without the Burstcoin. Please make sure to encrypt the message for safty reasons. @tinycoins I found out why it was not working. In the conf file there was a path to a loggin destination. The path was incorrect and made the program crash. I created an cmd file that executed the creepMiner.exe and added "pause" to see for errors. This solved it for me. Thanks a ton tinycoins! Ive been mining for some time on http://pool.burstmining.club/ but there is something not right. Ive just mined a block but got no reward at all. Ive also seen that I have about 540 burst and all og the sudden I had 40 but got no payout. Are the pool a scam pool? Any other had this issue whit this pool?